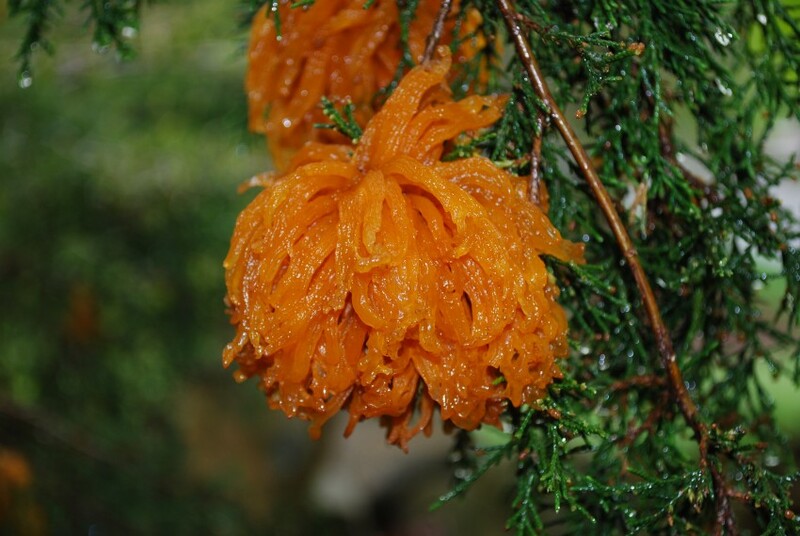 Just like clockwork and in time to thrill your mother for Mothers Day, the telia of the fungus Gymnosporangium juniperi-virginianae appeared on area junipers. The telia are unique reproductive structures formed by the fungus that causes Cedar-apple rust, Gymnosporangium juniperi-virginianae. Cedar-apple rust is a spectacular disease that exhibits distinct symptoms and signs on both Juniperus (Eastern red cedar) and Malus (crabapple) hosts. Telia are the result of infections some 20 months ago by spores produced on a crabapple. Telia swell in spring rains and produce non-mobile spores called teliospores that germinate into structures called basidia that produce basidiospores (did you get that?) Basidiospores subsequently fly to a crabapple. 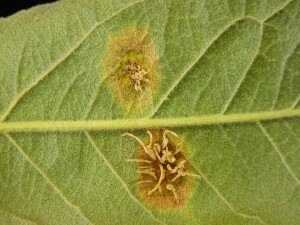 On the crabapple, infections occur that result in distinct orange leaf spots. Within the spots, reproductive structures called pycnia are formed. Some pycnia produce pycniospores and others make receptive hyphae. Pycniospores and receptive hyphae mate, and after their sexual tryst, the fungus grows to the lower surface of the leaf where other fruiting bodies (help, I need to rest) called aecia form. Aeciaspores drop from the aecia and travel in the wind to nearby junipers thereby completing the cycle by causing an infection that 20 to- 24 months later results in telia. 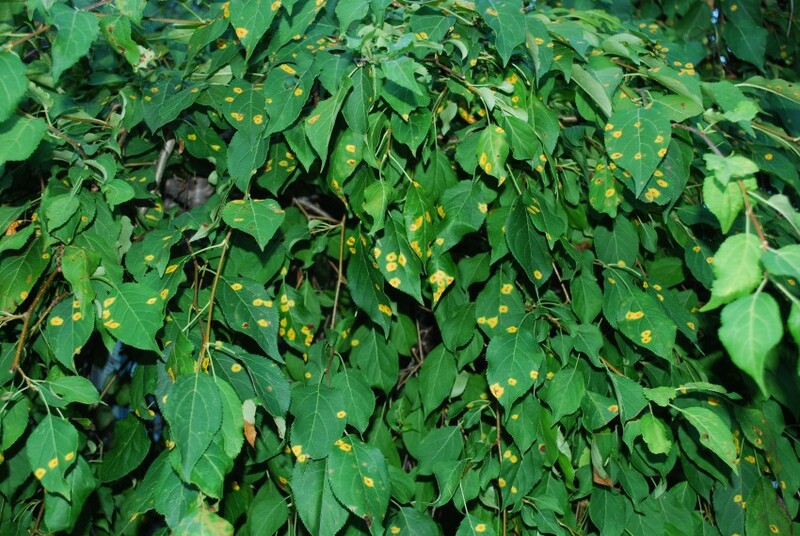 Despite the complex nature of the fungal life cycle, this is one disease that is easy to identify. The health impact on both the Juniperus host and the Malus is minimal in the landscape, so sit back and enjoy nature’s Mothers Day gift! 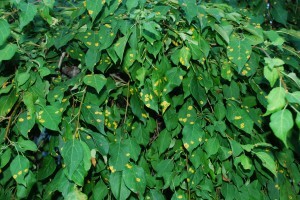 For more information on rust diseases in the landscape click here.